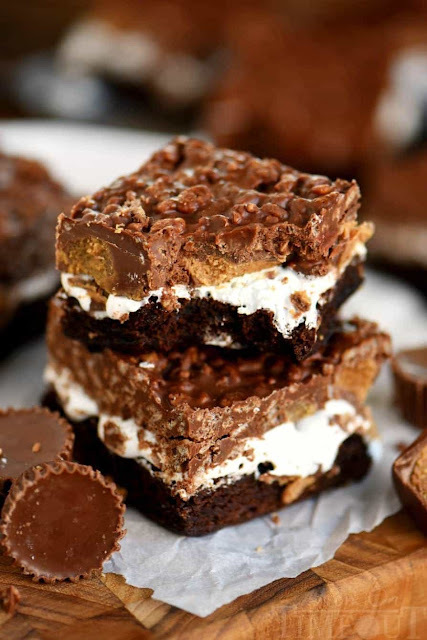 Reese’s Marshmallow Brownie Bars are the perfect dessert for a crowd! This easy dessert recipe is impossible to resist – full of sweet chocolate and yummy peanut butter…all you’ll need is a glass of milk! Reese's Marshmallow Brownie Bars are the perfect dessert for a crowd! This easy dessert recipe is impossible to resist - full of sweet chocolate and yummy peanut butter...all you'll need is a glass of milk! Prepare brownies according to package directions for 9x13 baking dish. Cool completely and refrigerate for at least one hour. Spread marshmallow cream on top of chilled brownies and return to the refrigerator for at least 30 minutes. Top with halved Reese's miniatures. Melt peanut butter and chocolate chips together in a microwave safe-container. Heat on high heat in 30 second intervals, stirring in between. Stir in crispy rice cereal until completely coated. Spread mixture carefully over the top of the Reese's. Return to refrigerator for another hour before cutting into bars. 0 Response to "REESE’S MARSHMALLOW BROWNIE BARS"